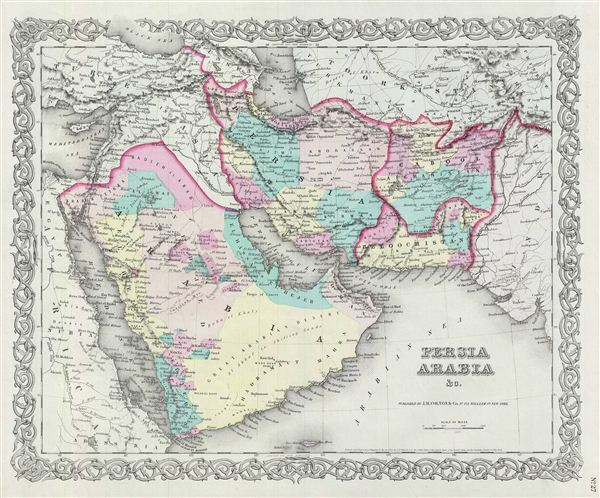 An excellent 1855 first edition example of Colton's map of Persia, Arabia and Afghanistan. Like most of Colton's Asia maps, this map was derived from an earlier wall map of the world produced by Colton and D. Griffing Johnson. The map covers from the Mediterranean east to India and south to include all of Arabia to the entrance to the Red Sea. Colton shows Afghanistan, Iran, Iraq, Jordan, and the Arabian Peninsula (Saudi Arabia, Yemen, Kuwait, United Arab emirates, and Oman). He also details adjacent parts of egypt, Abyssinia, Turkey, India and Turkistan. In this early edition of the map Afghanistan is divided into 'Afghanistan' and 'Beloochistan.' Later editions unite the provinces and drop 'Cabool' as an alternate name for Afghanistan. Persia at this time was controlled by the powerful Qajar Dynasty of Shahs. 1856 also marks the year of the Anglo-Persian War, a conflict between the Great Britian and Persia wherein the British opposed Persia's claim over the city of Herat. The war resulted in Persia withdrawing and signing the Treaty of Paris in which it surrendered all claims on Herat. This map also identifies various cities, towns, forts, rivers, desert oases, and an assortment of additional topographical details. Map is hand colored in pink, green, yellow and blue pastels to define national and regional boundaries. Surrounded by Colton's typical spiral motif border. Dated and copyrighted to J. H. Colton, 1855. Published from Colton's 172 William Street Office in New York City. Issued as page no. 27 in volume 2 of Colton's 1856 Atlas of the World.